Hi guys! 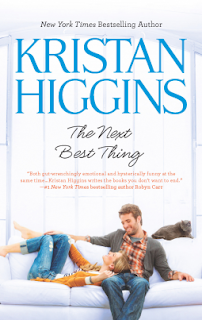 Thanks to Harlequin I have The Next Best Thing by Kristan Higgins to give away to one lucky winner!! To enter? Simply post a comment with an email address/Twitter handle so I can contact you. US only. Giveaway ends August 21st at 11:59pm. She's looking for a nice, decent man. Someone who'll mow the lawn, flip chicken on the barbecue, teach their future children to play soccer. But most important: someone who won't inspire the slightest stirring in her heart…or anywhere else. A young widow, Lucy can't risk that kind of loss again. But sharing her life with a cat named Fat Mikey and the Black Widows at the family bakery isn't enough either. So it's goodbye to Ethan, her hot but entirely inappropriate "friend with privileges," and hello to a man she can marry. This sounds great lol love the name Fat Mikey for a cat! Sounds like a fun end of summer read. Sounds terrific! I look forward to reading this. lwolfsf at sbcglobal dot net. I've heard wonderful things about Higgins. Thanks for the giveaway!